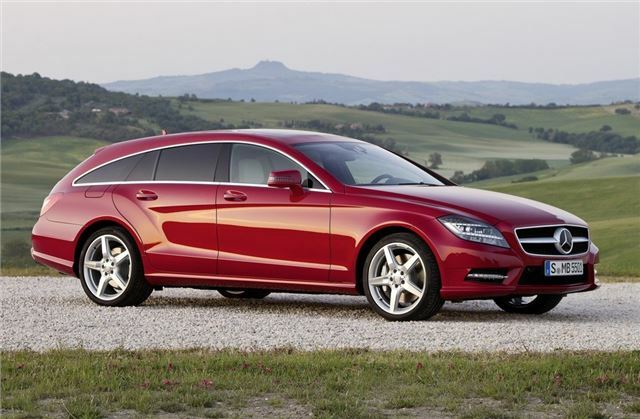 Mercedes-Benz has revealed that its new CLS Shooting Brake will cost from £49,360 when it goes on sale in mid-September. That gets you the CLS 250 CDI BlueEfficiency model while moving up to the six-cylinder CLS 350 CDI model sees the price increase to £53,000. With five seats and a 590-litre load space the CLS Shooting Brake promises to be usefully practical yet it retains the sleek and swooping lines of the four-door CLS. All models come with split folding rear seats, rear air suspension and an electric tailgate. There are two trim levels with standard models getting leather upholstery, parking sensors front and rear, metallic paint, xenon headlights and 18-inch alloys. The 350 CDI and top 63 AMG models also get the Comand Online multimedia system. For £2,995 more, there's the AMG Sport trim which comes with full LED headlights with Adaptive Highbeam Assist, AMG bodystyling, sports suspension, sports steering wheel and pedals plus 19-inch AMG alloy wheels. From October, the four-door version of the CLS will also get the AMG Sport trim, replacing the Sport line. Optional equipment exclusively for the CLS Shooting Brake includes an Easy-Pack load-securing kit with a rear sill protector at £255, aluminium rails costing £870 and AirMATIC semi-active air suspension at £1150. There is also a designo American Cherry Wood load compartment with black inlays which gives the boot a similar look to a yacht. It's not cheap though at £4030. The engine line up has two diesels and one petrol, all coming with the 7G-Tronic Plus automatic gearbox along with a start/stop system. The CLS 250 CDI BlueEfficiency has 204PS and averages a claimed 53.3mpg with CO2 of 139g/km while the top diesel is the CLS 350 CDI BlueEfficiency with 265PS. This returns a claimed 47.1mpg with CO2 emissions of 161g/km. At the top of the range is the CLS 63 AMG priced at £83,030. It has 557PS and an enormous 720Nm of torque.